The irony of our present situation becomes especially apparent amidst the booming new Yingkou. We took this long northern detour in order to avoid the over-industrialised region of Tianjin that would have laid on our way to Beijing. Instead, we landed from the fire directly into the frying pan. Here we are, amidst one of the hottest development zones in China, right in the middle of the Liaoning coastal economic belt, which has been designed to become a major heavy industry hub and international shipping centre. But today it should be different. North of Yingkou lays the biggest wetland and reed marsh in the world, which is under nature protection. The information in the guide book is impressive: 100 km2 of reed fields with the most completed ecosystem; millions of migratory birds of as much as 172 different species; 399 kinds of wild animals; one of the few breeding areas for endangered species such as the black-beaked gulls and red-crowned cranes. The most spectacular part of the marshland is a 26 km long stretch of crimson red wetland, fittingly named Red Beach, or alternatively, Red Sea. Its striking colour is due to a kind of grass – Sueda, or seepweed, – which is one of the few species that flourishes in highly alkaline soil. It starts growing in April and in autumn it turns flaming red. Our route today will lead us across this Red Sea, rather than through mammoth harbours and heavy industry plants. Or so we hope. We exit Yingkou along the 4,4 km long bridge over River Liao, another of the countless new bridges that do not yet exist according to the last year atlas of Liaoning and to our satellite navigation. Up and down it goes! Shortly after the bridge we have the first flat tire of our journey – the inner tube of the trailer wheel has totally worn out. “Luckily it happened while we are still in town,”- I say while Volker searches for the replacement. “Honestly, when something like that happens in China, I prefer to be as far away from towns and people as possible.”, he answers. Soon I understand why. Within half a minute a taxi stops in the middle of the street and the driver comes to us, the owner of the restaurant opposite together with the shopkeeper next door emerge too, and a couple of passers-by join in. Holding their mobiles ready, the spectators closely observe, document and comment every single movement of Volker. Themes such as Germans on the Road and Germans and the Art of Bicycle Maintenance are discussed at length. Though nobody lifts a finger to help, they all enthusiastically give us thumbs up after every successful procedure. After half an hour we are on the road again, having politely declined the offer to have lunch in the restaurant (Next time!). The coastal road is yet to be mapped, and according to our GPS we are hovering somewhere above the water. Quite fitting for a visit to the Red Sea. Contrary to our expectations the surroundings are not so different from the days before – a chemical factory here, a petrochemical one there, while trucks thunder past us, all heading direction north-west, towards the nature reserve. May be the nature reserve has been developed too, – crosses my mind, – and we will reach a digital exhibition of the Red Beach with virtual bird watching. The mystery is soon solved – a silhouette of yet another harbour appears at the horizon and a road branches towards the port of Panjin city. And here we are at the entrance gate to the Red Beach. A huge construction site beside the gate promises a hotel and the ubiquitous visitors’ centre in near future. We take the 18 km long elevated road that has been constructed through the wetland especially for visitors. I didn’t know what colour to expect in May, – green, or light pink, or may be orange? Even at such an early date, though, the Beach is true to its name. Sarah and Nora are thrilled by the unusual vista and we have to promise to take pictures, otherwise nobody in the Kita would believe them. And Sarah is happy that from now on she can have all the artistic liberty to paint the sea and grass red in her drawings. At certain points long wooden bridges bring us into the depths of the red expanse. 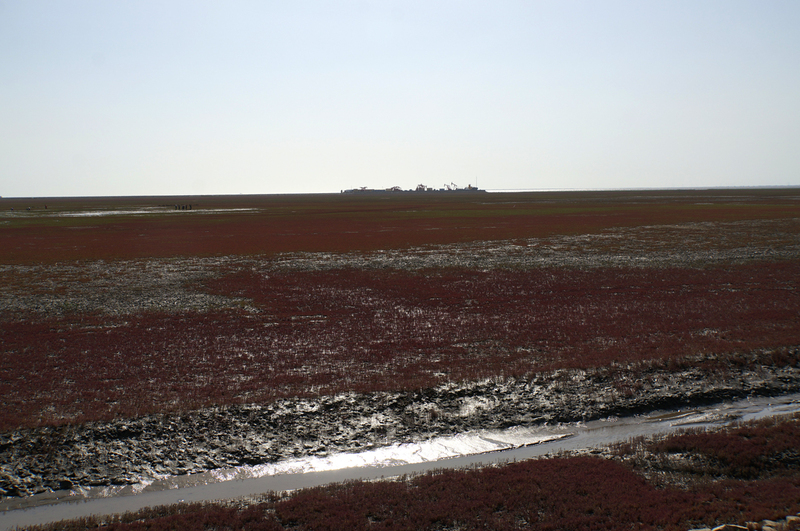 Even though the vegetation is still relatively sparse and the seepweed is yet to reach its deep red colour, the landscape is stunning: an endless carpet of various shades of red, with glimmering silver strands of water cutting through. Here and there we glimpse fluttering white birds, but we are too far away to distinguish whether they are cranes or gulls. Even more exhilarating is the biking on the almost empty broad road amidst the red, despite the strong winds from the sea. It should be crowded here in September, but now, at the very beginning of the season, the small shops are still closed, the boats for river trips docked. Some outlines of structures appear in the crimson distance. 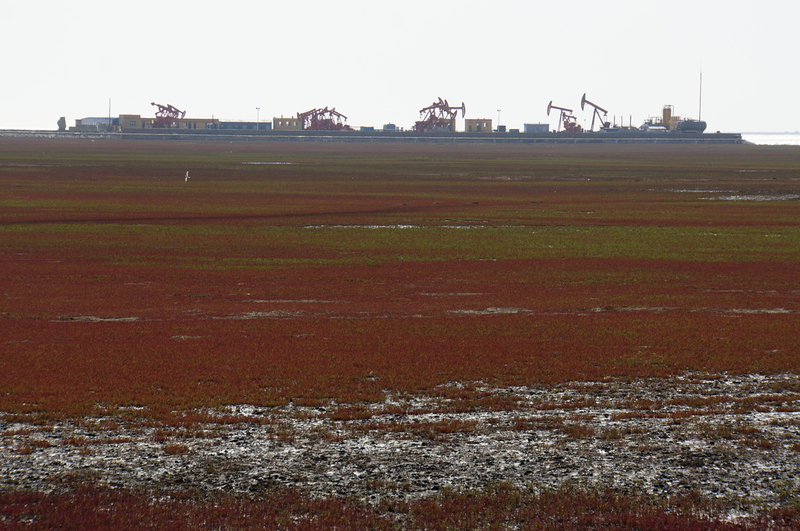 The guidebooks somehow failed to mention that the biggest marshland in the world happens also to be one of the three major oil-fields in China. 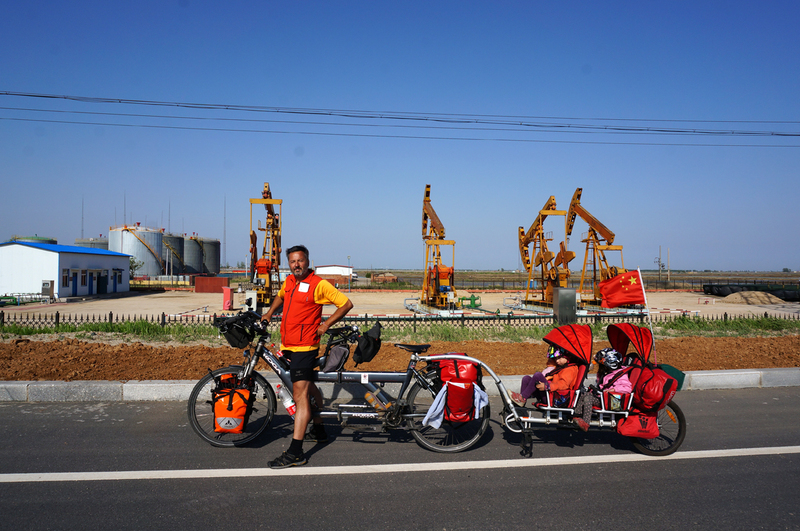 After few more kilometres we decide that it is time to take the usual tandem picture at the respective background. But suddenly there is no red background any more, we find ourselves standing in front of oil pumpjacks instead. “Bagger, bagger!”- shouts enthusiastically Nora. “This is no bagger,”- retorts Sarah, “looks like a big grasshopper to me.” Whatever it is, the kids watched entranced as the pumpjacks slowly nod their heads. “Klettern, klettern, dürfen wir dort klettern! !” – they are ready to jump off the trailer and climb over the wire fence. I wonder what will stick in their memory as the most vivid impression of today – the red sea, or the oil field equipment. Once we leave the Red Beach behind and turn towards northeast, we are almost flying. Could it be that the red has invigorated us? No, for once we have tailwind! We swish through the endless wetland, among small fisheries and rice paddies. Even at such high northern altitude, a short grained variety of rice is cultivated here. Shortly before we reach our planned stop for the night – the county town of Dawa, a group of bungalows set in an island of green appears by the road. “This is our place for tonight!”- Volker decides immediately. As he negotiates at the reception, the whole kitchen staff comes out for a chat, while the girls jump around in excitement and start to explore the grounds. Suddenly Volker emerges angry from the door. “Let’s go! We cannot stay here!” We are the first foreign visitors at the hotel and the manager is at loss. She claims they cannot register us, and sends us to the police station down the road, to register ourselves there first. “The police is very close – just 10 min. away.” By car. Can’t they bring our passports there? No, they don’t dare to take the responsibility. As I try to find the girls in the shrubs and break to them the sad news that we are leaving, the manager comes out smiling. A phone call to the police has resolved the problem. We are allowed to stay, all they need is a copy of our passports. It seems that our journey at the Liaoning coast turns to better, after all.